Oh, sweet Virginia, I just can't seem to get enough! 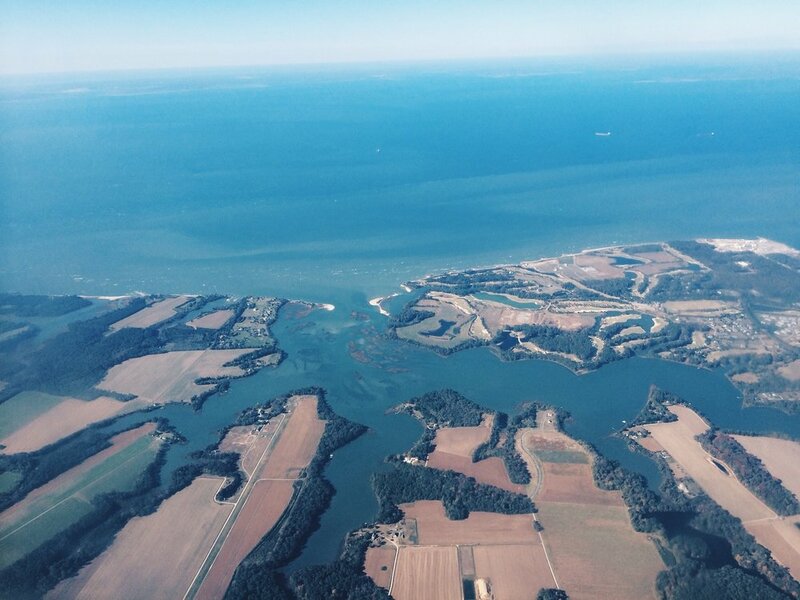 I recently made a second trip to Virginia's Eastern Shore to partake in a series of Wine & Brine Month festivities with a diverse group of writers from around the country. For an oyster loving-wanderluster, this was like a dream come true. It seems like every state along the East Coast has been touting their oyster offerings lately, but one in particular has really stepped up their bivalve game. About a month after my inaugural trip down to Virginia (Lynnhaven and Eastern Shore), Governor Terry McAuliffe announced the launch of the Virginia Oyster Trail and declared November as Virginia Oyster Month. Agriculture and tourism are VA's two largest industries—generating 52 billion and 22 billion in revenue, respectively—so it makes perfect sense to create synergies between them. For travelers who desire authentic, one-of-a-kind sensory experiences, the Eastern Shore offers a treasure trove of options. I arrived to Norfolk Airport on Friday morning with a small cohort of NYC-based writers. After a quick drive across the expansive Chesapeake Bay Bridge-Tunnel, we arrived at Cape Charles, ready for our first order of business: lunch. The Shanty is an airy, casual seafood outpost that is situated a few hundred yards from the main road. They serve an array of seafood and try to source local ingredients whenever possible. We started off with some raw Hungars Creek oysters on the half shell, which were mildly briny and possessed a subtle vegetal finish. The texture of the meat was delicately chewy, although somewhat scrambled. Oysters have a funny way of connecting people. I sat next to John Fall, publisher of Distinction Magazine, and we both quickly realized that we shared a mutual friend through oysters. By the way, Distinction recently published a wonderful article on oysters that everyone needs to check out. Later that evening, our group shuttled over a seaside town called Oyster for a private reception and dinner hosted at the newly renovated "Harvey" house (a repurposed/relocated general store built in 1907) that was catered by the amazing Amy Brandt of Amy B Catering & Events. We arrived just in time to catch a stunningly sunset as we savored some refreshing wild-harvested seaside oysters and cage-farmed Fisherman Island oysters in the back patio. The salinity of the two were similar, but the overall flavor profile and meat density/texture were quite different from one another. Wild oysters are often said to be less aesthetically-pleasing of the two—even "snipey" in some instances—but this lot was ruggedly handsome. Many had grown out to be quite round, deep-cupped, and full of meat. These two and three year old bivalves won over the majority of the slurpers. As we all chatted away, someone pointed to the night sky behind me and remarked, "Did you guys see that?" I turned around and couldn't believe my eyes. 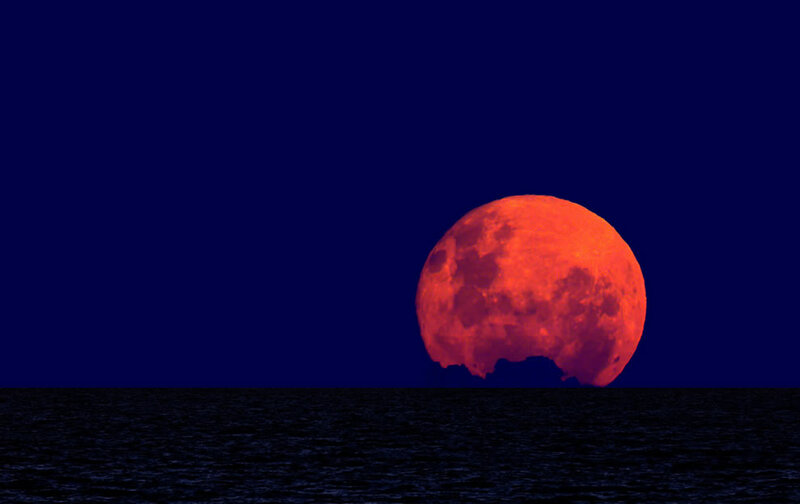 An enormous, bright orange moon was rising out of the seaside salt marsh in the horizon. I had never seen a moonrise before and this one was absolutely incredible. For a moment, I felt like I was standing on another planet entirely. All of us attempted to capture this breathtaking sight on our cameras, but with no success. We all ended up taking it in "analog" by simply using our own two eyes. After a restful night at Hotel Cape Charles and hearty breakfast at Cape Charles Coffee House, we headed over to Shooting Point Oyster Company to learn about oyster farming from Tom Gallivan and Ann Arseniu Gallivan. They're one of the first families to explore intensive aquaculture along the Eastern Shore and have been farming oysters along the Nassawadox Creek for about 14 years now. They are the ultimate aquaculture power couple. While Tom focuses most of his time on the grow-out process, Ann is all about the hatchery. She's a master oyster chef who's highly skilled in growing nutritious mixtures of baby oyster food from 12 strains of algae. Oh, and they also help raise millions of clam seeds for JC Walker Brothers Co., but that's a whole other story! Shooting Point Oyster Company grows two "handcrafted heirloom" varietals: Nassawadox Salts from Nassawadox Creek on the bayside, and Shooting Point Salts from Hog Island Bay on the seaside. Both are Crassostrea Virginicas, but they have distinctly different flavor profiles. I had a chance to taste test the two earlier this year at the Virginia Craft Event in NYC and could easily detect the difference in salinity. They also produce a boutique petite oyster known as the "Avery's Pearls" for Ryleigh's Oyster in Federal Hill, Baltimore. In their first year of commercial production, Shooting Point Oyster Company ended up with about 200,000 market-size oysters. Tom admitted that at the time they wondered, "What the hell are we going to do with 200,000 oysters?" You see, not so long ago, it was a challenge to sell a Virginia oyster. They were the unwanted stepchild of the half shell market, due to misinformation and lack of awareness. Today, it's a totally different story. The Gallivans plant 4-5 million oysters every year, handle 8-10 million and still manage to run out. Demand is on the rise and more people are getting into the game. "When we first started, we had the whole creek to ourselves. Now a dozen or so families in this area are growing oysters in some regard." A few hundred yards away from Shooting Point Oyster Company's sorting and storage facility stood the historic Bayford Oyster House. The shucking house was built in 1902 as a facility to process the millions of wild oysters harvested along the Eastern Shore. In its heyday, the Bayford Oyster House produced 150 to 200 gallons of oysters a day. It is only used now to shed soft shell crabs by proprietor HM Arnold. Inside the main room, a large stone table could accommodate five or six shuckers at a time. Each worker would stand in their own wooden stall and armed with a few basic tools to get the job done. It was time to set off for Chatham Vineyards by boat. Earlier this summer, I had lots of fun kayaking this scenic stretch of water with Ethan Watkins from SouthEast Expeditions. Being able to witness the foliage change over time was a special treat. The quiet, unassuming beauty of the Eastern Shore was really something special to behold. A few minutes into our leisurely cruise, Tom slowed boat down. He anchored the boat by dropping a long PVC pipe into a round opening at the bow and then reached underwater to tie a rope to one of the cages. Once the load was securely fastened, Tom used a winch to slowly lift the rectangular box of sunken treasure up on deck. As everyone's camera shutters clicked away, Sherman the Chesapeake Bay Retriever decided to be the first to investigate. Tom "unlocked" the cage and plucked a few Nassawadox Salts to shuck for us and recruited HM to help open the first few. HM demonstrated a unique shucking method that wasn't widely practiced in the Northeast. He held the oyster down against the edge of the boat bench with one palm and used the oyster knife handle to knock off the thinnest part of the oyster shell (the bill). The quick blow chipped open a small gap that allowed the blade of the knife to enter the oyster from the front. HM then cut the bottom adductor muscle first and presented the plump oyster meat on the flat, top shell. To be honest, the oyster looked a little alien this way! Naked and exposed, the edges of the oyster crinkled back into a tight curl. Most of the precious oyster liquor had dripped onto the floor, but the meat still retained a supple taste of the bay. To slurp these suckers up, everyone employed a hovering top-down approach rather than the standard tilt-the-shell-to-your-lips method. A little awkward at first, but great fun. Winemaker Jon Wehner was waiting for us at the dock in front of the Chatham estate. Tom pulled a slick 90-degree docking maneuver that would even James Bond proud. We unloaded one by one and began our short walk up to the winery. Chatham Vineyards sits on a very unique property that was discovered long, long ago. The land at Chatham, which overlooks Church Creek, was patented in 1640. To give you a frame of reference, English settlement on the eastern coast of North America began with the Virginia Colony in 1607 at Jamestown and the Pilgrims' Plymouth Colony in 1620. "What grows together, goes together," is a popular saying in the culinary world and this event really captured the spirit of it. Upon seeing the crush pad at Chatham Vineyards completely converted into an array of al fresco tasting tables, I knew that we were in for a treat. Each place setting had three glasses of Chatham Vineyard's most popular wine, their Steel-Aged Church Creek Chardonnay ('11, '12, '13), and a platter of five oyster varietals from four local growers. Jon kicked off the tasting with short overviews about each vintage. "Every wine has a story," he prefaced and explained that weather has a huge impact on the final flavors. In 2011, they rushed a harvest of 30 tons of Chardonnay grapes just 24-hours before Hurricane Irene. Jon characterized 2012 as a typical growing season that helped produce wines with great balance in acidity and minerality. Lastly, 2013 was deemed a unique year due to the cool summer and surprise heat wave in August. The 6 weeks of hot, dry weather candied the fruit, which produced a sweet, pineapple note in the wine. Grown by Peter Henderson, a long-time Eastern Shore resident, neighbor of the Wehners, director of the VA Eastern Shore Land Trust, and partner of Eastern Shore Events & Rentals. These delicately mild oysters had a great crunchy texture. The velvety, earthy meat gave off hints of shiitake mushroom and chalky minerality. I enjoyed pairing them with Chatham's Church Creek Steel Chardonnay '11 and '13. Grown by Bernie Herman, one of the most interesting individuals that I met over the weekend. When he's not tending to his private oyster restoration project, Bernie chairs the Department of American Studies at UNC-Chapel Hill. His signature Westerhouse Pinks possess a clean and refreshing sweetness, with and a tender, gelatinous texture. Paired nicely with all of the wines, but I think '11 was my favorite. Grown by Shooting Point Oyster Company, this bayside oyster has a resilient, meaty texture and rounded minerality. The difference between tasting the oyster here and on the boat in Nassawadox Creek is mostly its temperature. When it's a bit cooler, the sweetness is more pronounced. When it's warmer, the earthy and mollusky qualities shine through. Pairs elegantly with the '13. This is the punchier seaside oyster from Shooting Point Oyster Company that boasts a bolder, more rocky minerality. The meat is slightly leaner than the Nassawadox Salt, but has an interesting herbaceous quality to the finish. Paired well with the '12. Grown by HM Terry Co., this seaside oyster from the pristine waters of Hog Island Bay conjures ocean wave brininess against softer, more vegetal sweetness. Notes of seaweed and herbs come through with every chew. Loved pairing this oyster with the '12 and '13. After the oyster and wine tasting, it was time for lunch! Amy Brandt prepared a ridiculously beautiful and delicious three-course meal that showcased local ingredients in all their splendor. The first course featured white-wine braised yellow onions (onions were once my mortal enemy, but now my obsession) served in a thyme cream sauce with roasted sweet potato polenta. The second course was a luscious rabbit and pistachio terrine served with grape mostarda, fall lettuce greens salad, and Amy's rye bread. Last but not least was a simple and charming apple and black walnut layer cake with cider frosting. Ugh, heaven. There's one oyster tradition that I have been meaning to take on for awhile now. The oyster roast is a classic southern ritual where hundreds of oysters are consumed—usually in a free-for-all manner—by the community. Eastern Shore Events & Rentals brought out their special oyster roasting boat for the occasion. Watching the setup was almost as fun as the eating part. The feast underneath the big white tent was hectic, but pretty straight forward. Long tables were covered with gaping oysters and clams, and guys would periodically come around to replenish the lot with steaming trays of newly roasted shellfish. A few bottles of hot sauce were scattered about. Red plastic bins on the ground were laden with empty shells. About two dozen or so friends and strangers huddled around the tables wielding oyster knives and paper plates. Etiquette was pretty minimal and so participants probably felt like they were playing a game of Hungry Hungry Hippos. A lightly roasted oyster is a wonderful thing. If done properly, the meat would be juicy, succulent and tender. I pried my first oyster shell open and plucked out the date-sized nugget. I ate it like a piece of sushi. The taste was briny, earthy, and mollusky—similar to a steamed mussel or clam, but softer in texture. The flavor was actually not that far off from its raw counterpart. I was instantly hooked. One after another, I practically inhaled the better half of a tray in no time. The best pieces, I quickly learned, were from the clusters. These oyster condos (several oysters grown together to form discombobulated shapes) contained five or six tasty nuggets in close proximity. After the 20th... 30th... er probably the 40th oyster, I decided to take a break... and moved onto the roasted clams. The morning after our long and happy day of eating, drinking, more eating and more drinking called for (yep) more eating. Of course, I'm not complaining. One look into Amy's gorgeous kitchen studio and my appetite kicked back into high gear. We were treated to an array of amazing breakfast foods, from spicy sausage to virginia ham, and homemade granola to the world's most addictive biscuits. With full and happy bellies, we then went on a very special tour of Eyre Hall and Gardens with Furlong and Eyre Baldwin. Eyre Hall is one of the oldest and most well-preserved estates on the Eastern Shore. The property has been owned by the Eyre family since 1668 and the house (built in 1796) maintains much of the same trappings as it had two centuries ago. In 2012 Eyre Hall was deemed a National Historic Landmark by the U.S. Secretary of the Interior, although our hosts preferred to think of it as just home sweet home. What incredible American history though! The gardens have also been maintenance since 1800. We were a bit late in the season to see much color, but this lovely post by A Tidewater Gardner captures the garden in bloom. Exploring Hog Island with HM Terry Co.
Our last activity of the weekend was a brisk boat ride out to Hog Island with Heather Lusk and Rich Terry from HM Terry Co, a family-owned and operated clam and oyster company. Over the summer, I had a chance to wade in Hog Island Bay with the two. Unfortunately, the tide (and water temperature) were a little too extreme on this outing. We encountered several flocks of ducks and other waterbirds along the way. I managed to capture some great photos of them in flight. Once we reached Hog Island, everyone set off on their own exploration. I walked along the sand towards the Atlantic. Drawn to the soothing sound of the waves and peaceful solitude, I tried to imagine what it must have been like when settlers first made landfall here. To thaw out from the boat ride, we grabbed some soul-warming Texas-style BBQ at Willis Co Barbeque (closed). I really like their food and the ambiance. The main dining room featured floor-to-ceiling shelves with great knick knacks, including a very cool collection of vintage oyster tins! This oyster trip was amazing and it wouldn't have been possible without the generosity and coordination of many people. I'd like to thank Virginia Tourism, BCF, Chatham Vineyards, Shooting Point Oyster Co, HM Terry Co, Amy Brandt, The Baldwin Family, and Hotel Cape Charles for housing, feeding, educating and entertaining us.